It is time again for me to share a photo of the latest addition to my collection of green ceramics ! It is NOT a green ceramic vase, but it is green ceramic bowl in a shape of an apple. I imaging, that I can use the this bowl for serving of fruit pieces. I have brought this apple bowl at the well known Lange keramik in Aalborg. At the Summer preserves course we also learnt how to make strawberry & apple jam. As strawberries has a very low natural content of pectin, the addition of apples in the strawberry jam is used purely for gelling purpose together with the high level of sugar addition. It is possible for make a strawberry jam on it´s own using gelling powder, and here you can also adjust the sugar addition to your preference. I really love this Midsummer jam made from strawberry with elder flowers. Place the apple slices in a separate cooking pan together with the water part. Cover the pan with a lid and cook the apple over low heat, until the apples is quiet soft and pulpy, should look like apple mash (approx 10 minutes). Sieve the apple pulp, there should be around 340 g in total. Add the strawberries and the lemon juice in a large jam. Bring the content to the boil, let the fruit simmer gently until tender, approx 15 minutes. Prepare the jam glasses either by heating up in the oven or adding boiling water to them. Add the apple purée into the mashed strawberries and mix together to combine the fruit. Add the sugar into the fruit mass and stir until it is dissolved. Bring the jam to a rolling boil and boil hard until the setting point is reached. Stir the jam frequently. Test of set after 5 minutes using the flake test. When the setting point is reached, remove the pan from the heat and leave it to stand for 10 minutes. As the jam settles, push any scums from the surface of the pan to the side and remove it with a metal spoon. The purpose for the waiting step is well to build viscosity in jam, so the fruit pieces will be trapped inside the jam inside of be going to the top of jam. Gently stir the jam after the resting time and pour it into the prepared glasses, fill the glasses up to the brim. Remove any scum for the surface of the jam using a tea spoon. Close the glass with a lid. 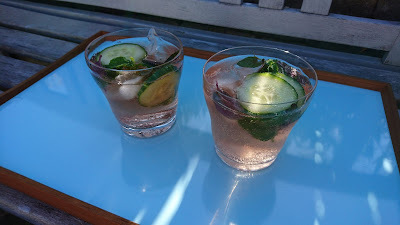 Leave the glass upright and disturbed to cool and set. At my participation at the Summer preserves course I realized, that I needed to make a new investment in some more kitchen equipment, so I really could use the acquired skills from the course. It turned out, that I needed to get hold of a jelly bag and a jam funnel. So I went shopping on the interned for these kitchen tools. At the Summer preserves course we also made a fruit vinegar in form of raspberry vinegar. It was quiet interesting for me to make a fruit vinegar with so much sugar inside. Our tutor did no recommend for us for mixing raspberry together with herbs such as rosemary, when making this vinegar. Using other fruit for such fruit vinegar you should use soft fruit without skin, so here blackberry could be an option to make blackberry vinegar, which I try out in Autumn. This vinegar can be used for salads, and could perhaps also combine well with goat cheese. 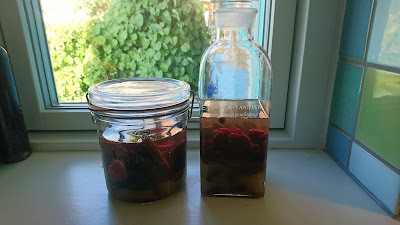 I have previously been making such fruit vinegar in my little kitchen such as this raspberry vingear with elder flower. Place the raspberries in a bowl and pour over the vinegar. Cover the bowl and leave it to stand for 3-5 days, stirring it a least once per day with a wooden, plastic or silicon spoon. After 3-5 days infusion mash the fruit with a a wooden, plastic or silicon spoon. Strain the mashed vinegar liquid through a sieve lined with muslin or use a jelly bag. Let is drain freely without pushing it to obtain a clear vinegar. Measure the liquid. For every 600 ml liquid weigh out 450 g sugar. Pour the liquid into a cooking pan and dissolve the sugar. Bring the vinegar to the boil. Pour the vinegar into bottles and seal. The Summer preserves course started by making a jelly of red and black currant. These two fruits are very rich in pectin by nature, so a jelly can be created by having enough sugar inside. It is the first time, that I have made a jelly by myself, but for sure it is not the last time I will make jelly. According to the tutor at the course Vivien Lloyd, the ratio between red & black currant should not be 50:50, as the black currant is too dominant in flavour. Place the fruit and water in large cooking pan. Bring to the boil. Reduce the heat, and let the fruit simmer gently for 20 minutes. Mash the content of the pan, so the fruit breaks. 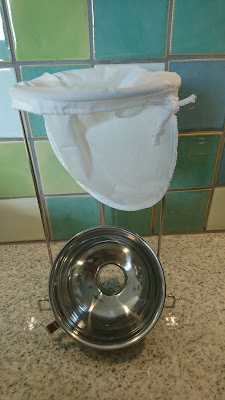 Place a jelly bag suspended over a large bowl. Pour the mashed fruit/water into the jelly bag. Leave until, the bag has stopped dripping. Alternative night over. Prepared the jelly glasses. I add boiling water to the glasses, while other will heat the glasses in the oven at 120 minutes. Measure the amount of fruit juice and weight out 450 g sugar per 600 ml juice. Pour the fruit into large cooking pan and heat up the juice to the boil. Add in the (pre-heasted) sugar, Stir until the sugar is dissolved. Bring the jelly mixture to a rolling boil (the jelly mixture has a lot of boiling foam on top). Let it boil for 4 minute as starting point. Test for a set after 4 minutes using the flake test (how the jelly is dripping from the cooking spoon). This is tricky, otherwise set, if the temperature is 104'C. When the the texture is right, remove the cooking pan from the heat. Start right away to remove any scum from the surface of the jelly, using a large metal spoon. Pour the jelly into glass jars, fill the jar to the top. Again remove any scum from the surface using a tea spoon. Seal the jar with a lid. Leave the glass upright and undisturbed to set. This week-end the annual festival of Danish cherries (kirsebærfestival takes place in Kertiminde. So in order to celebrate the wonderful Danishes cherries, I hereby share a recipe on cherries in rum with you. 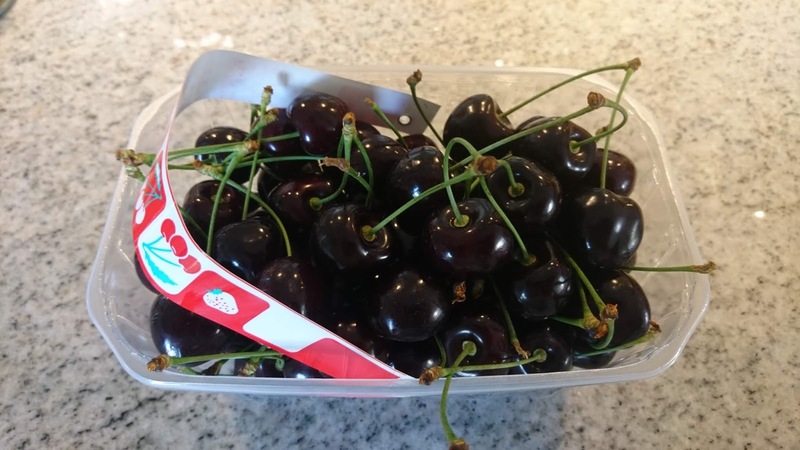 The cherries should stores for around three months, so they will be ready for the use together with the classic Danish Christmas dessert of ris a la mande, another option could be serve these cherries together with white chocolate panna cotta. At the course in Summer Preserves, the tutor Vivien Lloyd showed us how to make cherries in brandy. However, as I am not to keen on brandy, I decided to exchange the brandy as alcohol part with rum instead of. So here is my version of (Danish) cherries of rum. Remove the stalks from the cherries and de-stone them. Add in the sugar, cinnamon stick and allspice berries. Pour the rum on top. Agitate the glass daily, until the sugar is dissolved. Store for minimum 3 months. Can be used as dessert sauce for ris a la mande or other dessert. Mid June I participated in another course at Women Institute (previously courses have been afternoon tea course & Christmas afternoon tea course), this time on Summer Preserves with Vivien Lloyd as tutor. She is a great tutor, who was great in answering my many questions in relations to the many different types of Summer preserves. I was really dragging on her experience to see using your own eyes to see, when the jam has the right consistency for gelling in the jam glass or texture for a chutney. So I have learned to make jam without addition of pectin powder, but using the pectin naturally present in the fruit. However, using the natural present pectin alone from the fruit means, that the sugar content has to be very high to get a gelling. As usual the atmosphere at the Denman College is fantastic :-) All I meet of the other participants were very open and very friendly, they really wanted to meet new people. Upon arrival I went directly to the bar area after dropping my suitcase in my room, so I could meet all the participants over a cup of tea followed by a glass or two of wine. During the various meals you could easily sit at different tables talking and meeting some new people. The course price includes staying in a room, all meals, tea breaks, tuition and final all the preserves, which you bake during the stay. So I do not find it to be a very expensive course. Below you can see all my photos taken during the course. I will later share these recipes with you and as well my own modifications to the recipes. We were trying many different recipes on jams with either fruit or vegetable, fruit in brandy (or cherries in rum), cordial with herbs, gooseberry curd and chutney with rhubarb and ginger. And as usual I combined this course at Denman with some days in London (tea & gin-shopping, visit to Beefeater, afternoon tea and buying some interesting cooking books). Add all the ingredients into a big tumbler glass. When I am in London I always book afternoon tea at different places, and this time I booked aftenoon tea at Mad Hatters. The weather was lovely, so the afternoon tea could be enjoyed in the hotel court yard, which was full of flamingos as a way of celebrating the 50 years "birthday" of Laurent-Perrier Cuvée Rosé. The afternoon teat costed 75 £ including a glass of champagne and you could get re-fills of the tea. It was not exceptional, and in my opinion the afternoon tea at Fortnum and Mason was a better experience. The service of the waiters is good, but for me the taste and texture was average without any wauw effect. The names in the menu raise the expectation, which the actual food cannot fulfill, so I will give this afternoon tea experience a total of 3 stars. It has been some time since I last shared a post about a new addition of a green ceramic vase with you :-) so it is time today !!! This time is another smaller ceramic in my favourite colour of green (big surprise !!!! ), I have found this vase in decorate, which is one of my favourite shops in Vejle. This vase cost 118 DKK (15.50 €), and it was already found it place in my green vase collection. In connection with my first part of the Summer vacation, which I spend some days in London, before participating in jam making course at WI. Here I besides from visiting museums, drinking afternoon tea and filling up my suitcase with various shopping, I also found that it was also possible to visit the Beefeater Distillery. So I took my walking shoes on and went by feet to the distillery for a tour. The tour starts on the gin shop with different types of bottles of Beefeater Gin and various merchandise. The people in shop are very informative about the difference between the different gins. This shop is also the only place, where you can buy the gin called London Garden (guess what a bottle of this gin found it´s way into my suitcase). The tour starts with tour of the gin museum, which explain both the bad and good part of the gin history. One part is this gin cat, where you would put a coin in the cat´s mouth and when gin would be poured out of the tap at the cats leg, which way you could break the restrictions on gin sale !!! After the museum part a guide will explain how gin is created and what types of botanicals is used for gin. Juniper is one botanical, but in the plain Beefeater Gin 10 different botanicals is added. Afterwards the guide will take you to heart of the distillery, where you can the different pot for distillation from quiet small to large pots. The small pots are for the smaller gin types such as Burrough´s Reserve and London Garden. The final destination is off cause the bar, where you will be served a classic gin tonic with a slice of orange. According to the tour guide the master distiller Desmond Payne had approved the use of either lemon or orange for the classic gin tonic. But the bar was not allowed to use a slice of lime in the gin tonic. The master distiller was not around, so I could tell him, that I am a big fan of gin tonic with lime. The next time I am in London I will book a visit to another gin distillery. Good that my car has been upgraded from Peugeot 206 to 208, so more wine bottles could be transported back to Denmark after my Summer vacation in Alsace. I went more or less directly from the first part of my Summer vacation directly to Alsace. Well, I did empty my suitcase after my shopping spree in England, so I could bring back "goodies" from Alsace. Last year my mother and I were bringing back approx 40 bottles of Alsace wine in the small lion car, however this year I managed to get 55 bottles of wine, cooling box full of French cheese, two cushions and a flower in a hanging basket squeezed into the lion car incl. our luggage. My mother stated, that the flower would not be able to make the trip from France to Denmark due to the higher temperature, but she did not consider, that the new lion has climate control, so now she is envious about my big Summer flower !!! In mid June I had my first part of the Summer vacation, which I spend partly in England and partly in Alsace. My trip to England was a combination of some days in London, where I among other things enjoyed both a visit to a gindistillery, an afternoon tea and visits to various museums. The other part of my trip to England was another course at Denman on jam making. However, I still had time for some shopping such as buying different tea and some new cooking books. This time the tea I brought was refills for my empty tea tins from previous previous tea shopping in London in form of Rose Pouchong from Fortnum & Mason and English Rose and Earl Grey from Whittard. AT Whittard I also found two instant tea in form of Turkish Apple and Cranberry & Raspberry, which taste great cold after brewing. New bottles of gin also found their way to my suitcase. This also includes a hibiscus salt, which can be used for adding some red/pink colour strips into clear drinks such as gin tonics ! So my good friends in Horsens please consider yourselves warned about strange looking tin tonics, the next time you visit me in Vejle. The selection of gin in Billund Airport is actually quiet broad and divers compared to the gins available in Copenhagen Airport.Very often I find some new interesting gins, when I travel from Billund Airport. This time it was a rhunbarb & ginger gin from Whitley Neill, which taste great on it's own. The secon gin was the gin London Garden by Beefeater, which only can be brought at the the Beefeater Distillery in London. Besides from celebrating my 50 years birthday with an open house for neighboors and local friends from the area I also invited my good friends from birthday lunch a few days later on. As part of the table decoration I used some of my ceramic vases from my green ceramic vase collection. As supplement for the dessert, which was a part of the buffet lunch menu I had as well ordered a day in two layer from Vanilla (the best cake shop in Vejle), with the taste of raspberry and white chocolate. Mid May I celebrated my 50 years birthday, and it was a fantastic day. The day started at work, where I arrived to my work desk, which was covered with flags, birthday cards and birthday gifts from various of my good work colleagues. After work I went home for some birthday celebration, where I have invited my neighboroughs and friends living in the Vejle area for open house. So all in all I had a fantastic birthday full of celebration in the company of work colleagues, some great friends and good neighboor.